For years, State Comptroller Tom DiNapoli has refused to listen to the people of New York and divest the state's public pension fund from fossil fuels. Instead of investing in climate solutions, he's handing $13 billion in taxpayer money over to companies like Exxon so they can keep driving the climate crisis and causing disasters like Superstorm Sandy. 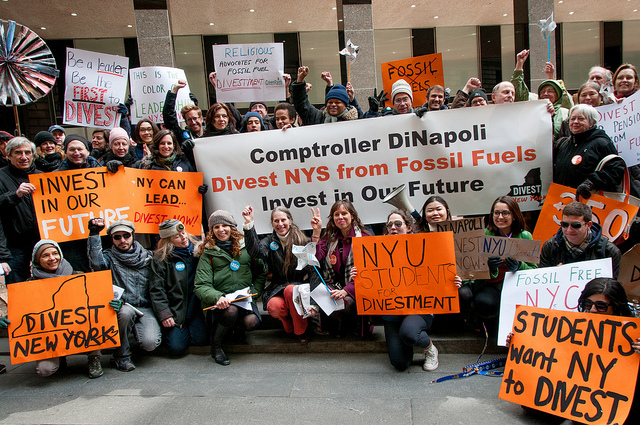 That's why we'll be in Albany on Feb. 27 to deliver 5000 postcards to DiNapoli demanding he #DivestNY. Afterwards, we'll spend the rest of the day in the Capitol to lobby state legislators on the NY State Fossil Fuel Divestment Act. Join us! When: Wednesday, February 27. Postcard delivery at 9:30 AM, Lobbying from 11:30 AM - 4:00 PM. Training and lunch will be provided. Where: State St. and Washington Ave, Albany, NY 12224, United States. Transportation to Albany will be provided from New York City. Comptroller DiNapoli insists he's leveraging his position as shareholder to get fossil fuel companies to change. He's yet to prove any of this is working. And every day New York remains invested in fossil fuels is another day that our state remains part of the problem, instead of the solution. Over 1000 institutions with assets totaling over $8 trillion have committed to divest from fossil fuels, including New York City. Our pension fund would be $22 billion richer had DiNapoli, its sole custodian, divested from fossil fuel stocks ten years ago. It’s past time for DiNapoli to take real climate action by moving our money out of coal, oil and gas companies and into climate solutions. Please RSVP with your availability. You do not have to be available for the full day to participate. Organizers will follow-up with you over email to schedule meetings and logistics.